Gift Vouchers and Gift Subscriptions - the perfect gifts for anyone interested in horses. Gift Vouchers: Choose from $20, $50 or $100 vouchers to be redeemed at the Hoofbeats Storefront - for subscriptions, backcopies, e-Magazines or latest issues - anything available on the Storefront. 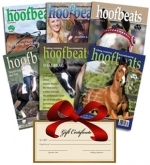 Gift Subscriptions: Give the gift of a 6 Issue (1 year) subscription to Hoofbeats e-Magazine or Printed Magazine.